Well, I feel as though the move and holidays ate the past couple of months (is this what the "dog ate my homework" excuses sound like?) but life is finally starting to get back to normal - I hope to post here a bit more often. I have a ton of projects that I want to work on this year. 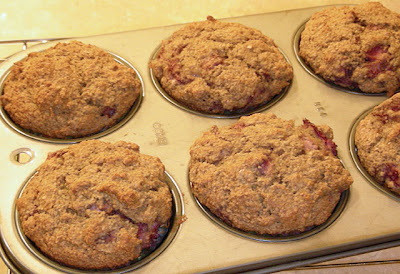 The oven at my new place is working and I've baked a few things, here are last night's strawberry bran muffins (original recipe from Farmgirl Fare) I of course tweaked the recipe to use what I had and ended up making several substitutions. This recipe is like a wonderful blank canvas, and I've several ideas already for future batches. I had one for breakfast this morning and have to agree with Farmgirl that they taste better the next day. Hi. Just wondered what tweaks you made to the muffins recipe. I don't have any oat bran - should I just make up the difference with wheat bran and flour do you think? Yours look very yummy! I ended up substituting multi grain hot cereal (not a cereal per se but rather different grains) for some of the oat bran to make the muffins lighter. I also cut back on the amount of sweeteners. It's hard to go wrong with these. I hope you tried and enjoyed them.